Whangaroa is a settlement on Whangaroa Harbour in the Far North District of New Zealand. 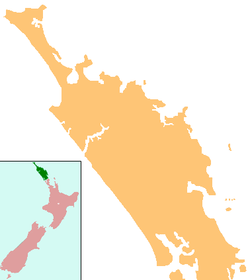 It is 8 km north-west of Kaeo and 35 km north-west of Kerikeri. The harbour is almost landlocked and is popular both as a fishing spot in its own right and as a base for deep-sea fishing. The harbour was the scene of one of the most notorious incidents in early New Zealand history, the Boyd massacre. In December 1809 almost all the crew and 70 passengers were killed as utu (revenge) for the mistreatment of Te Ara, the son of a Ngāti Uru chief, who had been in the crew of the ship. Several days later the ship was burnt out after gunpowder was accidentally ignited. Relics of the Boyd are now in a local museum. On 16 July 1824 on a voyage to Sydney from Tahiti, the crew and passengers of the colonial schooner Endeavour (Capt John Dibbs) stopped in Whangaroa Harbour. An altercation with the local Māori Ngāti Pou hapū (subtribe) of the Ngā Puhi iwi resulted in an incident where Maori warriors took control of the Endeavour and menaced the crew. The situation was defused by the timely arrival of the Ngāti Uru chief Te Ara, of Boyd fame. The incident was initially described by Rev. Tyerman as a mostly a problem of cultural differences, but in later years the story became a perilous cannibal adventure that defined the Māori (to European readers) as barbarian savages. In February 1827, the famous Ngā Puhi chief Hongi Hika was engaged in warfare against the tribes of Whangaroa. Acting contrary to the orders of Hongi Hika, some of his warriors plundered and burnt Wesleydale, the Wesleyan mission that had been established in June 1823 at Kaeo, nine kilometres from Whangaroa. The missionaries, Rev Turner and his wife and three children, together with Rev. Messrs, Hobbs and Stack, and Mr Wade and wife, were 'compelled to flee from Whangarooa (sic) for their lives'. They were conveyed by ship to Sydney, NSW. During a skirmish Hongi Hika was shot in the chest by one of his warriors. On 6 March 1828 Hongi Hika died at Whangaroa. ^ "Whangaroa Travel Guide". Jasons Travel Media. ^ Maxwell, Alexander; Roberts, Evan (2014). "The Whangaroa incident, 16 July 1824: A European–Māori encounter and its many incarnations". The Journal of Pacific History. 49 (1): 50–75. doi:10.1080/00223344.2013.869845. ^ Caroline Fitzgerald (2011). Te Wiremu - Henry Williams: Early Years in the North. Huia Press. ISBN 978-1-86969-439-5. ^ The Times, London, article CS118772953 dated 25 June 1827; retrieved 4 May 2004. Wises New Zealand Guide, 7th Edition, 1979. p. 508. Photographs of Whangaroa held in Auckland Libraries' heritage collections.